A couple of weeks ago I found this binder/planner at Goodwill ($.55!) 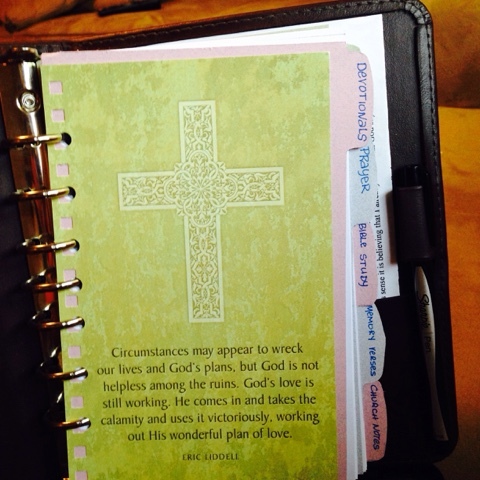 and decided to turn it into a devotional journal. 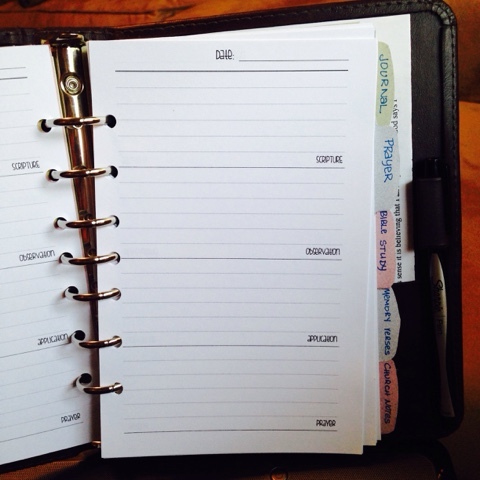 I traced my dividers from my planner onto card stock to make the tabs and started making my inserts. I decided to do my devotional section using the SOAP method: scripture, observation, application, and prayer. I kept everything short and to the point. 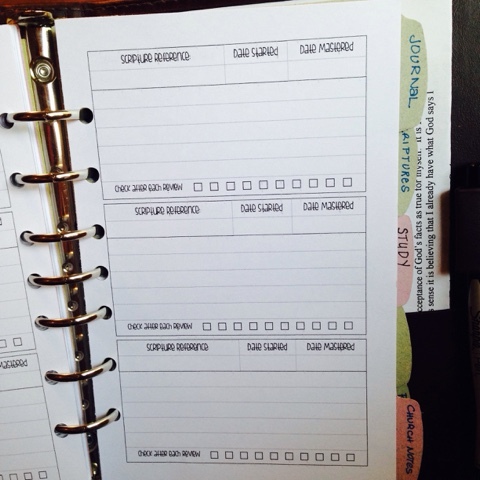 There are other section if I decided I want to journal a prayer instead of using the small section. The prayer request section is for simply that - a list of prayer requests from friends, family and church. Again, I can journal these prayers if I desire - this is just the reminders. Scripture memory is also something I am working on. This insert has a place for me to write down the verse I am memorizing and in my journal this is where I flip to when I want to review the verse. There's some little check boxes to show when I've reviewed it. I don't take myself to seriously - I don't need the check boxes but I like checking things off! I've had a Christian themed blank journal that has gone unused for years. 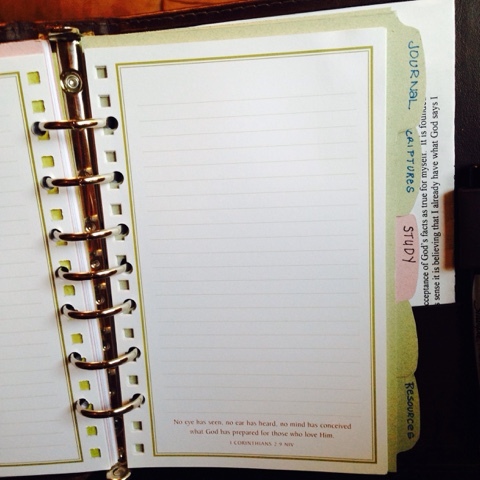 For this project I decided to uncoil the blank pages, punch holes and use them in my devotional journal. 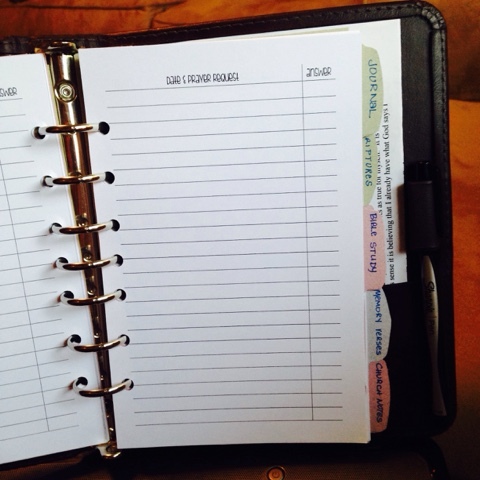 In this notebook I've used it for church notes, my journal section and my study section. I plan to use the study section for word studies and maybe a place to look up definitions and/or Greek words that add to the understanding of my Bible Study. 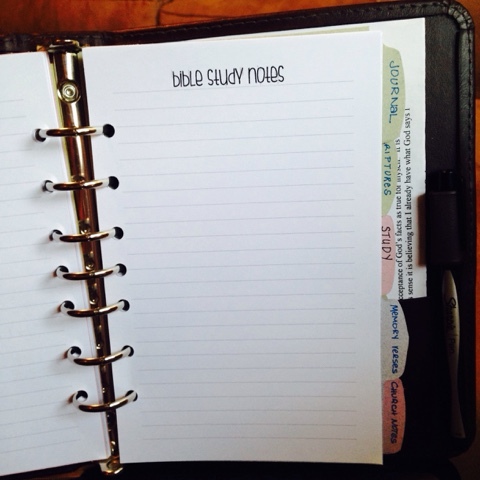 I also have a tab for "Scripture" where I do some sort of art journaling. Might be more correct to just call it doodling! I have all the inserts I've used, for you, if you are interested. You can download them here. This turned out fantastic! :D And your notes/SOAP pages are perfect! My problem with scripture journaling was always trying to figure out how to do it, so I just always ended up writing the verse number and any notes that went along with - but that made the notes make much less sense while looking back on them! Thanks so much for sharing. 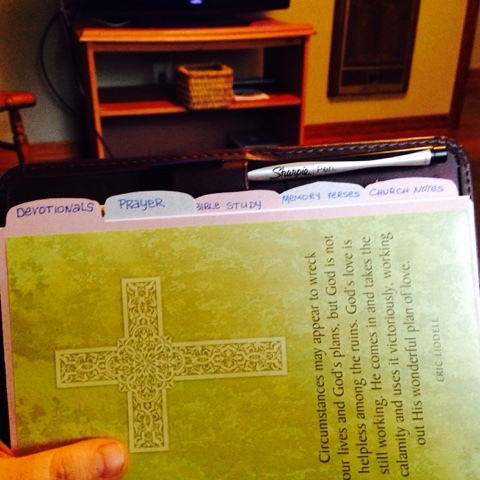 My prayer journal is regular sized paper. I will try to enlarge and add to my binder. I like the soap method. I currently use the 5 Ps method. All the inserts are available to download. Did you have something different in mind?